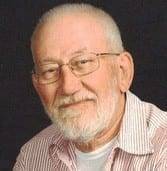 Darrel “Fuzzy” M. Thiel, age 82, of Edgerton, Ohio, passed away surrounded by his family at 6:00 P.M. on Wednesday, April 3, 2019, at Park View Nursing Home in Edgerton. He was a member of St. Mary Catholic Church and the Knights of Columbus. Darrel was a machinist and co-owned Rural Products near Edgerton for 32 years. He enjoyed hunting, fishing, spending time in the woods and with his family and tinkering with cars. Darrel M. Thiel was born on February 19, 1937, in Melbern, Ohio, the son of Lionel B. and Mabel (Fritch) Thiel. He married Barbara Ann Herman in Edgerton on June 1, 1957, and she survives. Darrel is also survived by his children, Reba McCain, of Edgerton, Theresa (Patrick) Combs, of Phoenix, Arizona, Daniel (Connie) Thiel, Gregg (Melinda) Thiel, Dean (Lisa) Thiel, Sonia (Dino) Flower and Vince (Shellie) Thiel, all of Edgerton, and Shane (Desery) Thiel, of Findlay; 22 grandchildren; 19 great-grandchildren; a brother, Cloard (Nira) Thiel; a sister, Dolores Dangler; and a sister-in-law, Margaret Thiel, all of Edgerton. He was preceded in death by his parents, a grandson, Jesse, and a brother, Cletus Thiel. Visitation will be held on Monday, April 8, 2019, from 2:00-8:00 P.M. in the Krill Funeral Home, 114 East Hull Street, Edgerton, followed by recitation of the Rosary. Funeral services will be held on Tuesday, April 9, 2019, at 10:30A.M. at St. Mary Catholic Church with Father Daniel Borgelt officiating. Burial will follow in St. Mary Catholic Cemetery, Edgerton. Memorials are requested to St. Mary Catholic School. Be the first to comment on "Darrel “Fuzzy” Thiel (1937-2019)"